This laboratory is equipped to characterize rheological properties over the full range of viscosities (i.e. from water to polymer melts), moduli and deformation rates, both in shear and elongation. Besides various types of viscoelastic fluids, also many different soft gels and tissues can be characterized. The equipment includes state-of-the-art commercial rheometers (rotational, capillary as well as extension) but also home-built setups. 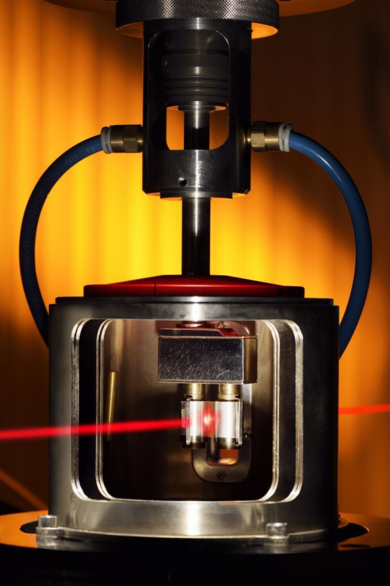 Rheological measurements can be combined with application of UV illumination or high pressure. In addition to monitoring the mechanical response upon flow, flow-induced structure characterization via optical microscopy as well as light scattering during and after flow can be performed. Several rheometers adapted for use at the X-ray facilities in Grenoble are also available. Finally, home-build dilatometers allow for the characterization of pressure-volume-temperature behavior during and after application of shear flow.